U.S. President Donald Trump’s failure in his first 100 days to fulfill his most aggressive campaign promises affecting bilateral relations may have calmed nerves in Mexico, but the Peña Nieto Administration is moving ahead with efforts to mitigate the impact of thousands of returning immigrants. Trump apparently has given up on making Mexico pay for his proposed border wall, and the U.S. Congress doesn’t want to foot the bill either. He has also toned down his threats to pull out of NAFTA – “the worst trade deal ever” – and seems to be edging toward a more modest renegotiation. But one pledge the Administration seems eager to meet is ramping up deportations of undocumented immigrants from Mexico. Trump is not immediately deporting the millions of “bad hombres,” as he initially promised, but he is steadily deporting thousands, including many who do not have criminal records in the U.S. There are even stories of Trump supporters shocked at the deportation of law-abiding and tax-paying business owners. Moreover, while he assured Dreamers – youths brought to the United States as children – to “rest easy,” there are reports of U.S. immigration detaining some of these working and tax-paying youth. The threat of mass deportations involving millions still looms large, and Trump’s unpredictability to settle on a course of action is increasing pressure on Mexican officials to act fast to mitigate the impact of the returning immigrants. President Peña Nieto has enacted a reform to the General Law of Public Education facilitating Dreamers’ entry into Mexico’s education system, accrediting their U.S. education and helping those without proper Mexican documentation. Critics have called his public appearance with deportees opportunistic, a ploy to get much-needed positive media coverage, but the measures like those in education have real benefit for returnees. Specific industries in Mexico are looking for specialized workers in the returning immigrants. The Mexican Association of Armored Vehicles (AMBA) estimated the availability of 50,000 thousand jobs for deportees in the areas of private security, armored car manufacturing, and transportation of valuables. As violent crimes have risen again in Mexico, this industry is in need of workers. Call centers are also actively recruiting. Their only requisite is fluency in English; no other experience is necessary. Many Mexicans’ perception of Trump as unpredictable and erratic tempers any optimism about bilateral relations even though Foreign Minister Videgaray seems to have established a viable dialogue with Trump’s son-in-law, Jared Kushner. The return of the deported immigrants is an area in which the government is being given a second opportunity to show compassion for citizens. The migrants left Mexico for concrete reasons, however, and some are questioning whether Peña Nieto’s administration will be able to address them. Providing legal assistance to those at risk of deportation and facilitating education for Dreamers are important gestures, but they do not offer a viable long-term strategy. The bigger picture is still suddenly having millions of Mexicans back in the country with no job prospects. Trump’s delays on the border wall and mass deportations give the Mexican government time to come up with effective solutions, but such a massive disruption, especially coupled with the uncertainty over the future of NAFTA and the Mexican economy, is probably too much for any government to handle. * Carlos Díaz Barriga is a CLALS Graduate Fellow. The immigrant deportation policy that the Trump Administration announced last week is among the most aggressive in U.S. history and promises to create tensions between Washington and Latin America and disrupt communities across the United States. Homeland Security (DHS) Secretary John Kelly has told agencies under his aegis to “use all authorities to the greatest extent practicable” to remove undocumented immigrants from the country. President Trump called his new initiative a “military operation” – which an embarrassed Kelly denied during meetings in Mexico City intended to control damage from other Trump statements. The White House said the measures will “take the shackles off” the enforcers, and U.S. media reported enforcement officers’ celebratory comments that they “can finally do their job.” The Administration will also ask Congress to authorize a large expansion – another 15,000 – of enforcement positions. The rationale repeatedly refers to deporting “criminals” – whom Trump calls “bad hombres” and “bad dudes” – but the new policy will exempt no classes or categories of “removal aliens,” including non-criminals. U.S. press already report roundups of individuals with no criminal records who are being expelled from the country within 72 hours. Fear among immigrants is pervasive, and there are many reports (such as here and here) of families hunkering down in their homes, withdrawing children from school, and setting up contingency plans for protecting U.S. citizen kids should their undocumented parents be grabbed by the authorities and sent abroad. The policy weakens protections from “expedited removal” that the Obama Administration put in place, which allowed immigrants caught after they had been in the country for 14 days or more to be released pending proceedings to determine their eligibility to remain in the United States. (Details remain murky but supposedly will be announced soon.) 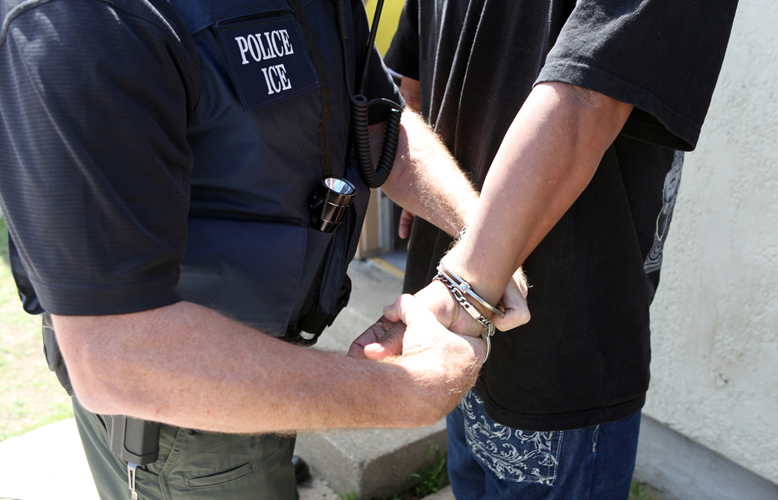 Individuals facing expedited removal are not entitled to appear before a judge. It increases efforts to press local police to help federal agencies find and deport undocumented immigrants, blurring the line between local and federal forces. Legal experts say this commingling of forces violates the Constitution, and many local police chiefs lament that it reduces the willingness of immigrant communities to help them fight crime. It removes privacy protections for people who are not U.S. citizens or permanent residents, putting their personal information in the hands of vigilantes, blackmailers, and others who have no need to know it. Trump previously threatened to withhold federal assistance from “sanctuary cities” in the United States, which he accuses of causing “immeasurable harm to the American people and to the very fabric of our republic” because they are reluctant to implement his deportation policies. Two new measures suggest a long political campaign against undocumented immigrants. DHS will create an office – with the acronym VOICE – to collect information from victims of alleged crimes. It will be funded with “any and all resources that are currently used to advocate on behalf of illegal aliens” (most of whom have never committed a crime). The Administration will also “identify and quantify all sources of direct and indirect” assistance to Mexico, obviously to evaluate U.S. leverage against the Mexican Government if the Administration is not pleased with compliance with Washington’s wishes. Deporting all 11 million undocumented immigrants estimated to be in the United States will be impossible, but the new measures will push unprecedented numbers of Mexicans and Central Americans back into societies that have no jobs and no security for them. That burden and the loss of immigrants’ remittances will cause those countries incalculable harm. The Administration’s rhetoric hammering on “criminal immigrants” is deceptive: DHS admitted in 2014 that most of the “criminals” it deported were guilty only of their undocumented presence (31.3 percent) and traffic violations (15 percent), and it would be foolish to expect that the Trump government will be more judicious. The insinuation that immigrants commit more crimes than do native-born citizens, moreover, has been debunked; they are incarcerated at a rate half that of native-born. These polices may enjoy the support of Trump’s political base, but the attacks on the defenseless; subversion of traditional values such as the right to legal counsel and the right to privacy; coercion of local police and civilian authorities; and the deportation of countless friends and neighbors whose everyday contributions enrich community life in the United States will have a profound impact extending far beyond its immediate victims. First, the administration has encouraged the use of “prosecutorial discretion,” which is the agency’s authority to enforce the law against a particular individual as it wishes, and has prioritized the deportation of violent criminal offenders and others deemed to be “national security threats.” The removal of convicted criminals – a category that conflates those convicted of aggravated felonies and misdemeanor crimes – is more time- and resource-intensive, thus reducing the overall total of deportees. Though positive, the relatively small decrease does little to offset the Obama administration’s staggering deportation totals – 1.8 million since February 2009. Nor does it signal an attempt to reverse course in light of the rapidly approaching 2 million mark. The Obama administration is undoubtedly walking a political tightrope on the issue. It is pressured by the right not to appear lax on enforcement, while many on the left want the president to sidestep a deadlocked Congress and loosen up on removals – a move Obama himself has characterized as executive overreach. As the deportation rate remains steady, Obama risks eroding the support of Latinos, an increasingly powerful segment of the electorate. So pervasive is the fear of deportation that, in a recent survey conducted by the Pew Research Center, a majority of Latinos said protection from deportation was more important than a pathway to citizenship. This would suggest that lawmakers might eventually be open to allowing undocumented immigrants to attain legal status even without a chance to naturalize. Some 205,000 U.S. citizen children lost a parent because of deportations between July 2010 and September 2012 alone, and a growing number of them face the prospect of having to accompany a deported parent back to Central America, potentially increasing the political urgency for a fix to the country’s broken immigration system.